quick update guys. i just wanted to let u know i'm still here and working. it's just that, as per usual, it's the type of stuff that i'm really not allowed to show/talk in detail just yet. red tape - go figure. didn't think i'd have to deal with that when it comes to art but evidently that's quite common in this line of work. sooooo.....i'm posting pics from Free Comic Book Day! theFranchize and I had such a blast at Captain Blue Hen Comics. if ur anywhere near Newark, DE and u haven't discovered this cool comic shop yet, u MUST go. they have some of the best people in the business working there. normally we're at Third Eye Comics in Annapolis, MD but this year we were invited to CBH. it definitely feels like i'm cheating on the fantastic folks at Third Eye but both shops have amazing people. anyways, Flash couldn't make it cuz his wife just had their newest baby like 6 days before FCBD. hopefully next year all 3 of us will be there. thanks so much to the coolest people that came out to FCBD and stopped by our tables. i seem to find myself humbled so much more with every con/show that we go to. its indescribable to see some of my fans come out to see me. i have the best fans out there - guaranteed. 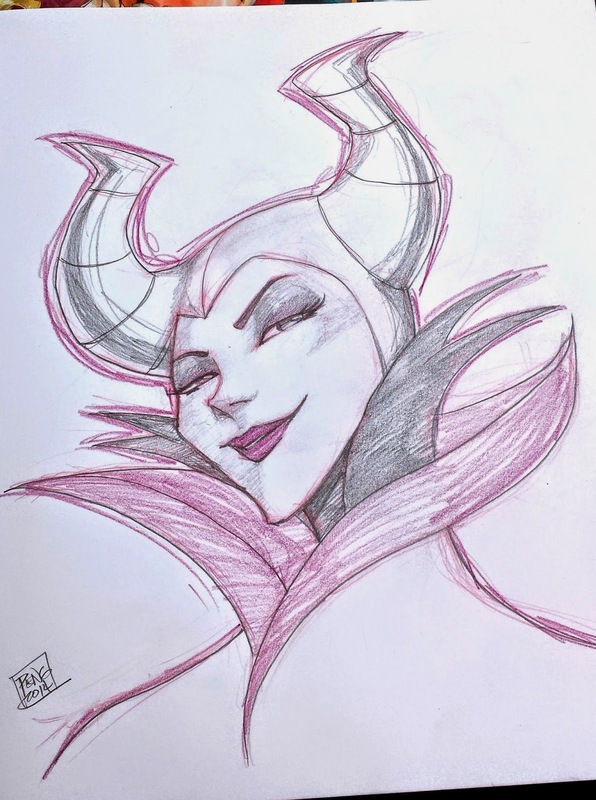 the Maleficent sketch was for a fan that told me i could pick any Disney villain cuz he knew i love love love Disney. now one would think i would pick Ursula but as Disney villains go, Maleficent is my favorite. u ask me to choose and 9 out of 10 times i'm gonna pick her. cuz she is a true agent of the forces of evil. cursing babies?!? that's a bad bad lady. i guess Hades is a bad dude too cuz he tried to kill Hercules (obviously i'm talking about the Disney version), but Hades is Hades so... as u can imagine, i'm SUPER excited about the new Maleficent movie. u mean my lady-crush plays my fav disney villain?! where has this been all my life?! 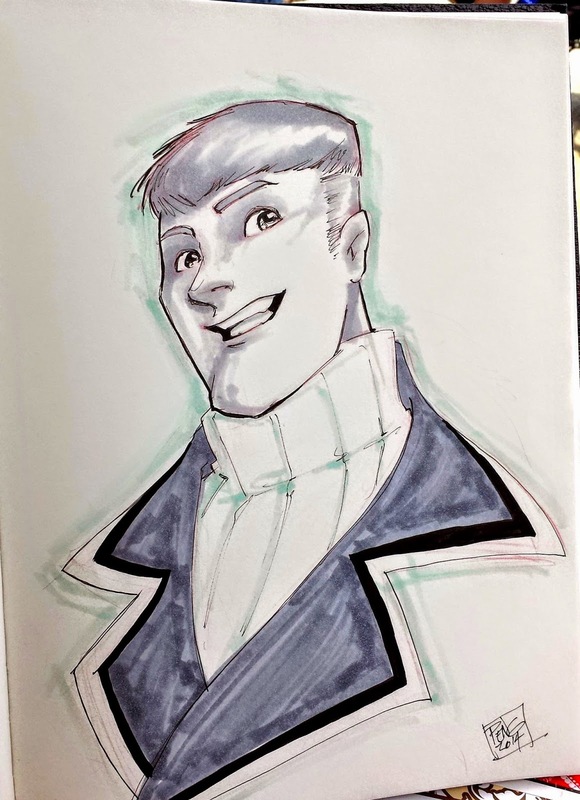 the Guy Gardner sketch was for another fan who had a book of Guy Gardner references. theFranchize told me not to draw the bowl cut version but i welcomed the challenge! i wanted to make the turtleneck and bowl-cut look cool. =) oddly enough, only after the show did i notice he kinda looks like Kristoff (from Frozen). guess i have been watching it a lot. 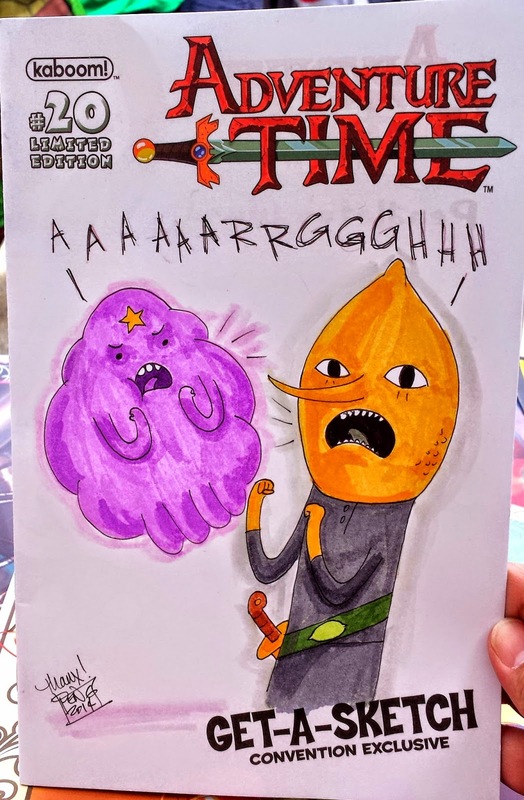 and any excuse to draw LSP, well, i'm all about it.